Many images were made by various OCT companies over the last 2 years of the akinetic laser’s development; however these images had all been the proprietary property of the companies making the images. This changed in early 2013, when external and independent images were finally made public. The following images suffer from being made at 1550 nm and only for 40 nm range, but the resulting image quality from measurements made under these conditions was reasonable nonetheless. In vivo human skin measurements at 1550 nm with 20 µm isotropic resolution. a) 3D reconstruction of the data set; b) 3D reconstruction of the dataset with a portion of the data removed to reveal the internal structure of the skin; c) cross-sectional tomography extracted from the 3D dataset; the data enclosed in the overlapped rectangle correspond to equivalent overlapped rectangle (vertical plane, blue) in b); d) en-face view extracted from the 3D dataset; data enclosed in the overlapped rectangle correspond to equivalent overlapped rectangle (horizontal plane, green) in c). Acquired volume dimensions were 5 × 5 × 5 mm3, corresponding to 1024 × 256 × 180 pixels (width × height × depth). Presented images were cropped along depth (z) to report only useful imaging area. Scale bars correspond to 0.50 mm. Courtesy Vienna Medical University. 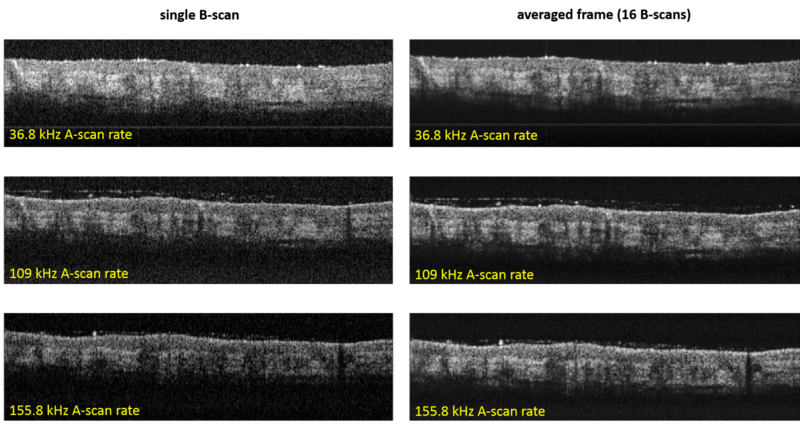 Single frame and averaged in vivo skin measurements acquired by the same akinetic laser, at different laser sweep rate, under program control. a-c) single frame measurements at 36.8 kHz, 109 kHz and 155.8 kHz sweep rate respectively; e-f) average of 16 frames (M-scan), sweep rate similar to a-c respectively. During the measurements, the coherence gate was located close to zero delay. Images dynamic range, from a to f, was 25.69, 24.18, 23.91, 35.12, 34.57 and 34.38 dB respectively. Images area was 5×1.7 mm2, corresponding to 1024×60 pixels (hor. × vert.). Courtesy Vienna Medical University. En-face view of a tooth. Size 5 x 6 mm2 (1024h x 256v) . 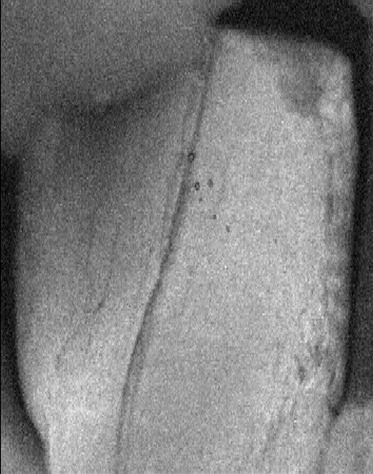 The same tooth is imaged at different lengths in the image below. Courtesy Vienna Medical University. 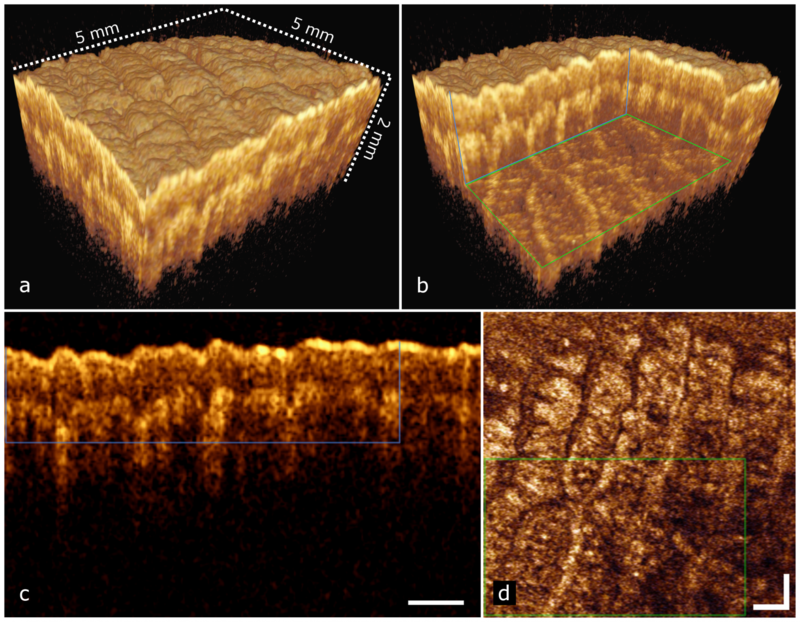 To illustrate deep coherence, images of a tooth (including crack) with zero path length delay, and then the same tooth with 16 mm to 135 mm of path length delay. Long akinetic laser coherence length may enable new OCT measurement approaches and techniques. Images were generated using 1550 nm and 40 nm span. Courtesy of Vienna Medical University. Nail bed, taken at 1550 nm, 40 nm sweep width. Courtesy Vienna Medical University.